I received Susie's Hope DVD complimentary from Flyby Promotions in exchange for an honest review. The opinions expressed are 100% my own. 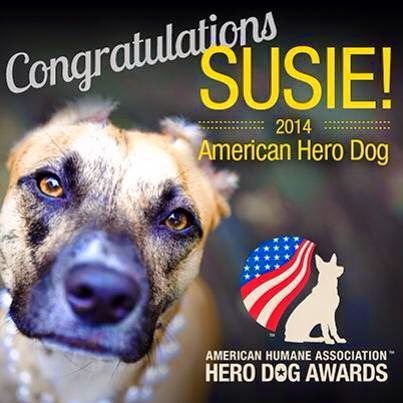 Based on the true story that successfully passed Susie’s Law in North Carolina, which seeks stricter punishment for animal abusers, Susie’s Hope brings to life the inspirational relationship between pit bull attack survivor Donna Lawrence and Susie, a pit bull-mix puppy found beaten, burned and left for dead. Recognizing reflect and abuse were to blame for the tragic attack that nearly claimed her life 10 months earlier, Donna resumes the battered animal and accepts her as family. Together, they learn to heal, love and forgive as they lead a historic effort to seek justice and protection, not only for Susie, but all animals. Starring Emmanuelle Vaguer (40 Days and 40 Nights), Burgess Jenkins (Remember The Titans) and Andrea Powell (Ender’s Game, The Twilight: Breaking Dawn Saga: Part 2), Susie’s Hope is an incredible story of love, loss and redemption. Susie's Hope DVD is a little cheesy and the acting isn't amazing, but that didn't stop me from thoroughly enjoying the movie. I love movies that are based on true stories and this one delivers a great message. The message is one of hope, forgiveness, healing, compassion, and action. I find it inspiring that Donna Lawrence was able to overcome her fear of dogs after being attacked by a neglected animal. You will hear the amazing story of how she survived and helped an abused dog also survive. A human attacked by a dog and a dog attacked by a human, who together help each other heal from experiences no human or animal should have to endure. Susie and Donna's story is worth hearing.